Planning a trip to Sicily? Then, make sure you won't be feeding the Mafia! If you have a scientific interest in the physics of the radio, you should browse this site as an e-book! This is a brief presentation of Francesco Errante's theorem on the physics of the hertzian radiation. The hertzian radiation is the oldest, yet the least common way to refer to radio-waves. It takes its name after Heinrich Rudolf Hertz, the first physicist and engineer to have demontrated the possibility of radio transmissions. Ever since Hertz experiment and untill now, it was believed that energy would travel all the way from the transmitter to the receiver while maintaining its original form, hence, erroneously crediting electric signals with the property of being able to travel in the empty space. Hertz, him-self, named his own apparatus misterious emissions as "electric waves". Subsequently, they were renamed as "electromagnetic waves". First of all, it is paramount to comprehend that the hertzian radiation is a natural phenomenon with an artificial origin. Although, the hertzian radiation mirrors the nuclear reactions photonic emission mechanism, it takes place at frequencies far lower than those present in nature - eg: Sun's nuclear fusion and its radiations. See energy and radiation wavelength. In nature, radiations get generated by matter's violent energy excitation which involves very high tempertures and consequentially very high frequencies. Radiations of wavelenght longer than those of the infrared rays spectrum, in nature, have no known practical function, although, they still retain scientific relevance. In the hertzian radiation, instead, the excitation is artificially imposed by means of electric oscillation. Electric oscillation is a means to obtain the excitation of the electric charges and it must not be confused with the hertzian radiation it-self! Unfortunately, this is what has been happening untill now. 2) hertzian radiation can only take place following an energy transformation, named radio-electric transduction. Here is a brief introduction to the Author's logical development of his ideas, concepts, observations, deductions and patented devices leading to his findings. Simplification is the main rule in the observation and understanding of physical phenomena. Simplification, though, must not be confused with a simplistic approach and it may require the development of tailor-made tools and technology which can them-selves be far from being simple. The stripping of a radiator to its bare essentials. 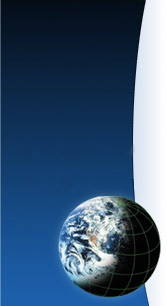 The ½ of a wavelength open dipole antenna, since its birth, has always been considered to be the most simple available antenna and therefore it has always been the specimen on which to conduct studies. Those studies, however, were ill at birth as the open dipole is not an aerial as simple as it looks. In addition, having considered the open dipole an "elementary antenna" has shifted the focus of those studies away from its essence and into its properties and its effects. Consequentially, the theories about its intimate functioning are flawed and are responsible for a number of further well radicated misconceptions. Moreover, this has prevented from establishing how the hertzian radiation takes place. Hertz experiment. The apparatus for radio-electric transmission and reception. Birth of the hertzian dipole antenna, 1887. By means of a particular radio-electric circuitry for the suppression of anyone of the two branches of a ½ of wavelength open dipole, I have demonstrated, once and for all, that the open dipole is not an elementary antenna (by definition an elementary antenna is an aerial where the condition of resonance and radiation cannot take place without the presence of all its parts) but it is, instead, an "elementary array" of 2 elements, of a physical length equal to ¼ of a wavelength each, which are electrically arranged in a counterphase, while being fed in the middle of them. Once it has been established that the focus should be placed on the behavior of a single element of physical length equal to ¼ of wavelength, further research has allowed me to come up with a truly "elementary radiator" to further distinguish between the source of the radio-electric signal and the actual radiator. The elementary radiator, infact, comprises a radio-electric circuitry and a ¼ of wavelength radiator which can be easily detached and substituted by a dummy load (anti-inductive load), in order to conduct RF measurement on the circuitry alone, while, radio-scopic observations of the actual radiator emissions can be carried out by means of a particular detector which exploits and, at the meantime, demonstrates the phenomenon of the radioluminescence from secondary ionization induced by hertzian radiation. The radio-scopic observation by radioluminescence. By employing my detector, I have carried out several non-intrusive radio-scopic measurements on the radiator over the full spectrum of the shortwaves, anywhere between 1 and 30 MHz with an RF power ranging from 100 mW to several kiloWatt. 3) that the bulk of the energy is always radiated by the region towards the end of the radiator.. Demonstration of the Ist Errante's law by radioluminescence. The image above shows the energy distribution on an half wave folded dipole and on an half wave open dipole, both in a condition of resonance, while being fed with two RF signals of equal amplitude and wave length. It is observed how on the first case the light emission reaches its maximum intensity in the middle of the dipole while on the second case the light emission reaches its maximum intensity towards the ends of the dipole. Ist. Errante's law: any radio-frequency electric signal or any radio-frequency electric impulse that is injected onto any electrical conductor of any shape, will ALWAYS give origin to hertzian radiation starting from the point opposite to that of feeding. Radio-electric measurements and radio-scopic counterverification. Conversely, further measurements have allowed to verify the absence of hertzian radiation on conductors (transmission lines) while in a progressive wave regime. 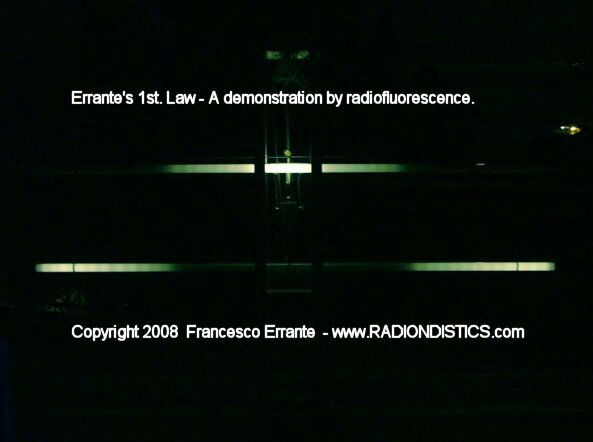 Demonstration of the IInd Errante's law by radioluminescence. The images above show the absence of hertzian radiation on a balanced transmission line, in a progressive wave regime, while being runned with a 1000 Watt RF signal. Either terminated on a reactive or a non-inductive load. IInd. Errante's law: any radio-frequency electric signal or any radio-frequency electric impulse that is injected onto any electrical conductor of any shape properly terminated onto a load having an impedance value equal to that of its source, will NEVER give origin to hertzian radiation. This mechanism is, therefore, a form of controlled or limited standing wave regime, if it happens within the length of the radiator then we have resonance, if it exceeds the length of the radiator we have a random standing wave regime with less or no radiation. In the hertzian radiation mechanism, the antiparticle is nothing else than an electron flowing back in the opposite direction to the one it was initially injected from. Hence, the minus sign of one of the two Dirac's equation solutions indicates the negative direction of the particle and not a negative charge of it! Errante's radio-electric transduction mechanism is fully consistent with Prof. John Archibald Wheeler's own intuition as aknowledged by Richard Feynman in his Nobel lecture. Moreover, evidence shows that the law of conservation of energy holds true, while leaves no room for keeping on theorizing about the positron and the antimatter. according to this Author's findings, the physical mechanism responsible for the generation of the hertzian radiation is different from what it was previously theorized and accepted as true. The forecast of a concatenation between the electric field and the magnetic one, as offered by Maxwell's equations, describe the electric and the magnetic fields engaged in an endless cycle of mutual creation. This interpretation bears a fundamental error which lies in the fact that the concatenation between fields was thought to be in the fashion of an overlaying and NOT in a relay-race like full-cycle progression as it happens to be, instead. In the light of this Author's findings, it can be affirmed that there is no such a thing as an electromagnetic wave, an electromagnetic field or an electromagnetic signal. There are, instead, photonic emissions (radio waves) that follow the same wave form and frequency of the signals that have generated them, capable of inducing electromotive forces onto the matter with the same frequency and wave form. As a direct consequence of this findings, when it comes to radio-electric transduction, the concept of electromagnetic induction does no longer hold true, either. Accordingly, the mechanism by which an electrical conductor (ie: radio antenna) gets affected by the hertzian radiation must be different from what it was previously thought too and everything points to nothing else than a simple photovoltaic effect, just as observed by Hertz and Hallwachs in the ultraviolet radiation spectrum. The transmission and reception of a radio-electric signal, from a point to another of the empty space, is not, therefore, a simple transfer of energy in the same form and the radio-frequency electric signals do not have the property of travelling in the empty space. 2nd from hertzian radiation back to radio-frequency electric signal. The minimum number of two transductions it's what it takes in the case of a direct line-of-sight radio propagation. This particular phenomenon involving an energy transformation of a radio-frequency electric signal into a radio-frequency radiation and viceversa, is called radio-electric transduction. The radio-electric transduction is a spontaneous phenomenon where an ordained form of energy gets transformed into a disordered one with a different form and viceversa. This transformations can be repeated an infinite number of times but with regard to energy loss it is an highly disadvantageous exercice. The devices capable of enhancing the radio-elettric transduction, are defined as radio-eletctric transducers and are commonly known as "radio antennas". Please, take a look at our new all-in-one apparatus for the physics of the hertzian radiation and the radio-electric transducers. Here ! are the original novelty works of FRANCESCO ERRANTE. Patents & Copyright © 2003- of FRANCESCO ERRANTE. Material is governed by the Copyright, Designs and Patent Act. Copies of these documents made by electronic or mechanical means, including information storage and retrieval systems, may only be employed for personal use.